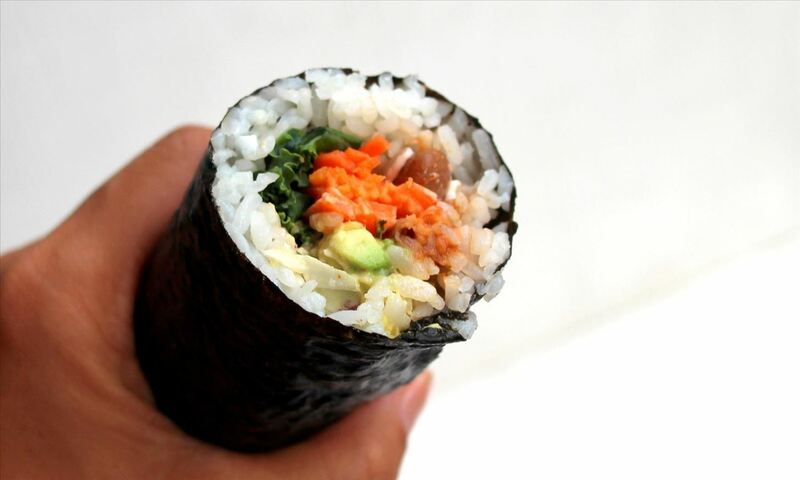 However, if you're Korean, then you'll recognize the "sushi burrito" as an uncut Korean rice roll (gimbap; also romanized as kimbap), the quintessential snack food for children, students, and adults on the go. 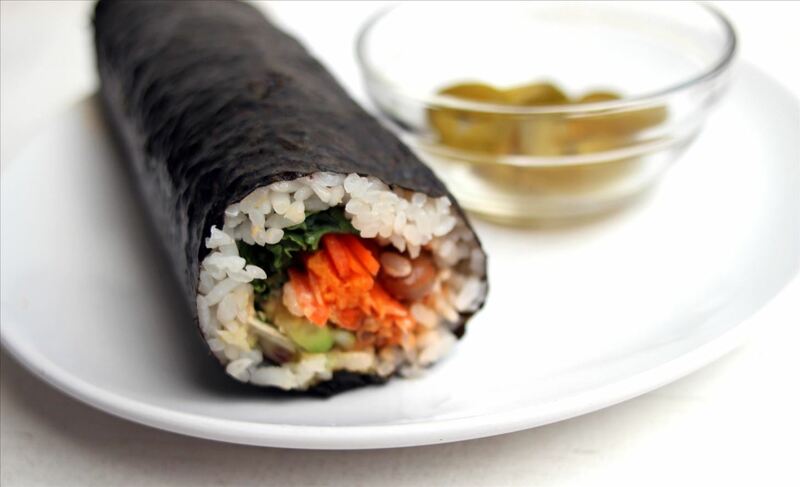 So it's not unusual to see Koreans eating uncut gimbap because of its handheld portability. Japanese will also recognize this as an ehou-maki (an uncut maki roll), which started as a tradition in the Kansai region that became popular nationwide. By using seven ingredients, not cutting the roll, and facing the year's lucky direction, good luck is guaranteed. Simply put, the concept of an uncut sushi roll has been around for a long time in other countries. But the recent appeal of the sushi burrito in the U.S. can be attributed to North America's current obsession with Asian-Mexican fusion cuisine. Although most sushi burrito recipes seem to skew more Asian than Mexican, a sushi burrito is versatile and can be made with whatever ingredients you prefer—be they Asian, Mexican, or something completely different. 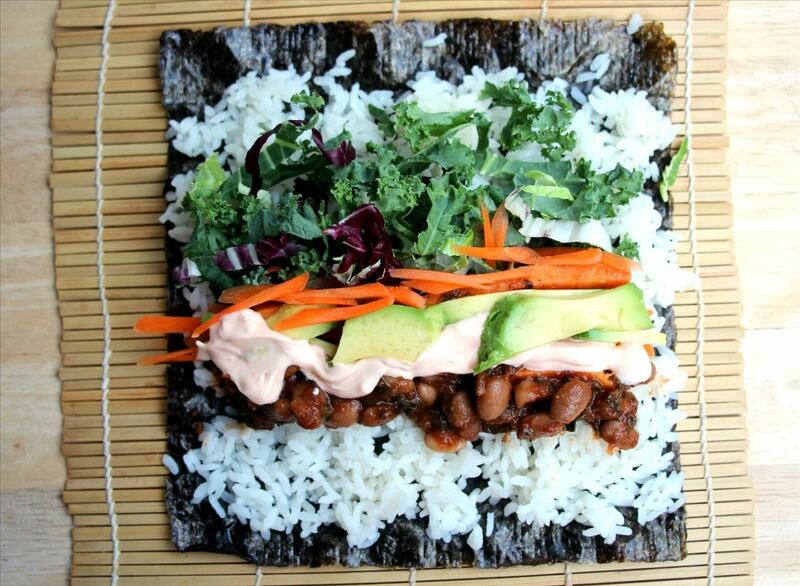 If you're interested in creating your own sushi burrito, follow this simple ratio formula. Some great ideas for sauces include sriracha mayo, teriyaki sauce, pico de gallo, or anything else you prefer. The sushi burrito I'm creating here includes shaved lettuce, cabbage, Brussels sprouts, sliced avocado, sweet potatoes, beans in sauce, and sriracha mayo. Feel free to follow my ingredients list or create your own. 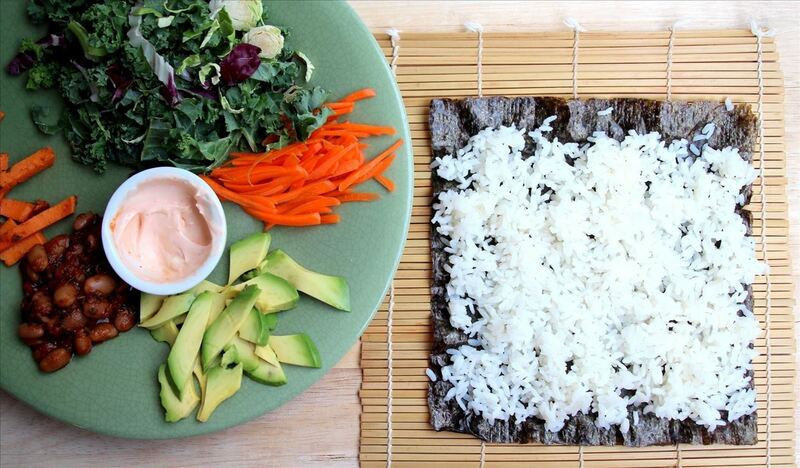 Spread the rice evenly, leaving about ½ inch at the top and bottom of the seaweed. Layer the ingredients in the center of rice, leaving room above and below the rice. Drizzle sauce, if using, over the center of the ingredients. Put your thumbs underneath the bamboo mat, then pick up the mat and roll the mat away from you and toward the other side of the mat until you've passed the center that contains the filling. Curve your hands over the top of the mat and press gently to push all of the filling together into what will be the center of the roll. Release the mat, then continue to roll the sushi burrito toward the other side of the mat, being sure to squeeze gently with each roll to keep the ingredients tightly wrapped. Like I mentioned before, sushi burritos are adaptable and can be filled with anything you like or have on hand. The most important thing to remember is that a variety of textures and seasonings is necessary for a seriously tasty sushi burrito. Let us know what your perfect sushi burrito would include in the comments below.